No need to stand in line with fast-track tickets to some of London’s most popular tours and attractions including: Madame Tussauds, London Dungeon, Tower of London, Harry Potter and Warner Bros. Studio Tour, London Eye and more! Purchase tickets today! Buy your tickets here to LEGOLAND® Windsor Resort near London! Westminster Abbey is one of the most famous and historic churches in the world with a history stretching back over a thousand years. The church is a must-see when visiting London. Purchase tickets in advance to this world famous church! 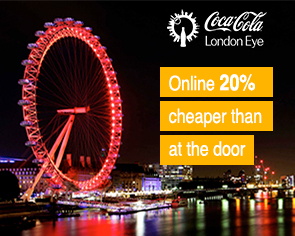 Save up to 15% on one of London's biggest attractions - the London Eye - and skip the line! Enjoy amazing views of London and skip the long line for an unforgettable day for everyone! Book your skip-the-line tickets to the London Dungeon here and avoid the lines completely! The Dungeon - one of London's top attractions - brings together the eerie history of London in a unique combination of live actors, special effects, and thrilling rides. Book your tickets online & save 25% with our exclusive discount! Enjoy an unforgettable day in London everyone will love! Get faster access to the popular Ferris wheel, the London Eye, and save up to 15% on your tickets compared to the price at the door! This is your best option for Fast Track access PLUS a flexible, open ticket. Enjoy this unique, award-winning sightseeing cruise on the River Thames and see many of London's incredible attractions. Located just below the London Eye, it’s the perfect way to top off a ride on the iconic Ferris wheel. Book your skip-the-line tickets online and avoid all the lines! SEA LIFE London has one of Europe’s largest collections of marine life and is a must-see for anyone who's interested in sea life. At SEA LIFE London, you can among many things experience over 500 species and plants, see over 40 sharks from 12 different species, meet a Gentoo penguin and experience the fascinating world of jellyfish in the new exhibit Ocean Invaders. Eat, drink and feel famous at Planet Hollywood, a themed and unique dining experience inspired by the glamour of Hollywood, with movie memorabilia on display throughout the restaurant. Prepare to be treated like a movie star! Book with us and save 15% on your meal.